Anwar's Reflections is one of Trenton, New Jersey's up and coming media outlets. Through its timely content and cutting edge technology, Anwar's Reflections is committed to being a trusted community consumer advocate when it comes to its arts, entertainment, eateries, and recreational programs. Anwar Salandy is the creator of Anwar's Reflections, a cutting edge local blog. He has interviewed such prominent individuals as Trenton Mayor Tony Mack, Poor Righteous Teachers front man Wise Intelligent, and internationally known public intellectual Cornel West. Throughout his career, Salandy has worked with various well-known publications doing freelance work. From Rider University's Literary Journal On Fire!! to the Philadelphia Daily News, this young yet prolific author has made his rounds in a competitive industry. 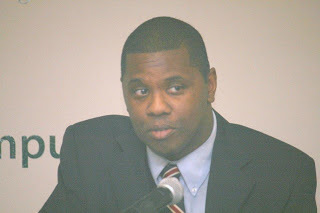 Currently, Salandy is a blogger/ citizen journalist for the Trentonian.Com. Salandy received his undergraduate degree from Rider University and his Master's Degree from Thomas Edison State College. He currently resides in Trenton, New Jersey.